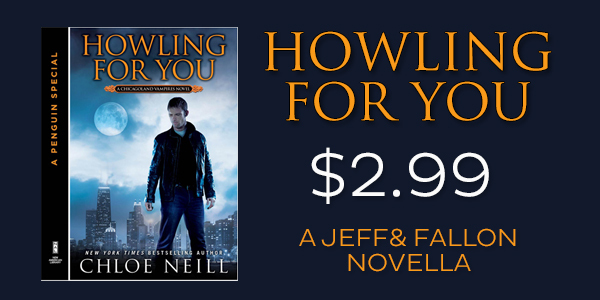 Order HOWLING FOR YOU from Amazon, Barnes & Noble, iBooks, or Kobo! Will you have Howling for Preorder at Barnes & Noble? I would love to get it on my Nook. Just pre-ordered mine at Barnes & Noble for my Nook. 🙂 Can’t wait for the release tomorrow!!!!! I love The Chicagoland Vampire series! I think I’ve read them all several times over and am about to start again! I am most interested in the Jeff and Fallon book release. I’ve wanted to explore the shifters world a bit more, but I must say, I do love the Luc and Lindsey story as well. I don’t usually write to authors, but I am a huge fan and I Chicago is my hometown, is there a way to join Cadogan House, as it said to leave a comment to join? I don’t have a password to enter the house but I look forward to many happy years of reading your books as many times as possible as I wait for new releases! And I would love to join the house and explore the world more. I must say that your Chicagoland Vampire series is my favorite vampire series. I have read so many different ones and yours is defiantly in my top two. I love Merit the Vampire, she is awesome and I can relate to her so much. And Ethan reminds me so much of my boyfriend Jesse, down to the eye and hair color its scray…lol. I am not from Chicago but after reading this series I want to go and visit there some day. I’m super excited for ‘Howling for You’. Jeff is one of my top 5 people from CLV. I like that we get to see a bigger picture of his & Fallon’s life, which of course will include the one and only Gabriel (Yummy)! This book and Wild Things is sure going to be interesting and a blast! Thanks Chloe!